I know it's been quite a while since I wrote but I've been up to quite a lot these days (and months) so I have an excuse. Welcome to the newest part of Shoot Like a Pro - Advanced, Hope you'll like it. I guess from time to time each one of us wants to take a few street shots - because we have some spare time but lack the money to travel somewhere far away or just because we want to try out our hand at street photography. In its essence, street shooting is the easiest and the most difficult genre. It's difficult because you need to have a keen eye and to know when to shoot and when not to do it. It's easy because you document real life events and you just need to keep you eyes and ears open. So far so good, but what are the basics? 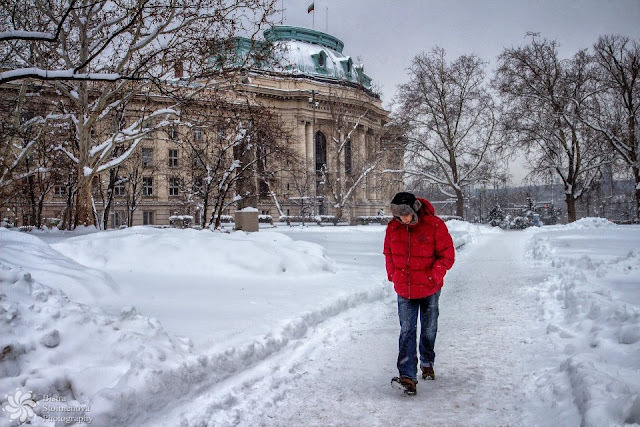 I'm by no means an expert but here are a few tips and tricks - I'll use my most recent street shoot from my home town - Sofia, in winter as an illustration. You simply CANNOT go out shooting without knowing what is where around town. This includes knowing not only where to go but where you should NEVER go. You see, photo equipment is too expensive to risk it for nothing. Besides, if you are a 5-feet-tall girl like me, you'll think twice before going out to the ghetto. So step one is to see what is available and if you'll be able to access the place in a safe time of the day. The picture above is from a place called Lavov Most (literal translation for that would be Lion's bridge). It's a really picturesque place BUT in recent years it's a gathering place for illegal immigrants (called refugees by the West). It's absolutely NOT safe to be here after dark and I know it because I did my homework to check. In the pic you see only ordinary people because it was too cold (-15 Celsius) for anyone else to go out wait for whatever. The location check includes knowing when to be around places and when you'll get the best lighting and/or subjects. 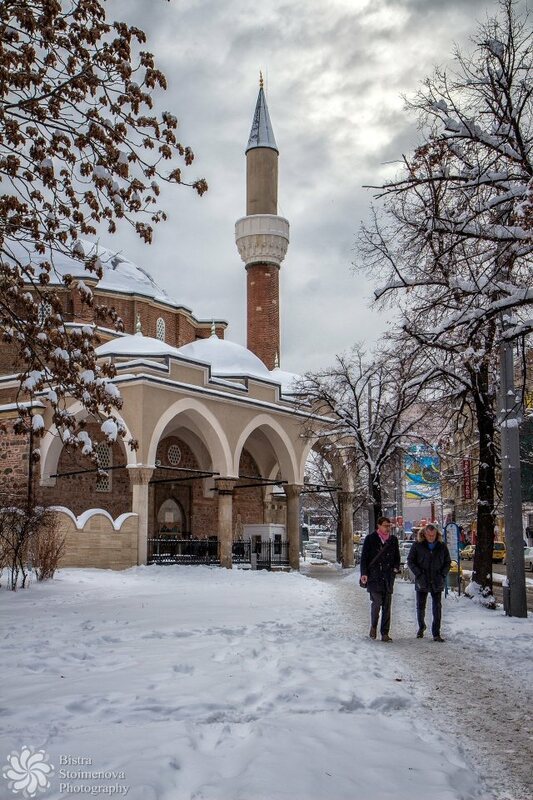 This a picture of the famous mosque in Sofia (built by the architect Sinan back in the 16th century and still currently in use.) - and it's NOT a Friday - so I can roam around and take as many pictures as I want. As you can see from the pictures above - when heading out for street shots, I include people in the frame. Key to that is to AVOID getting noticed. 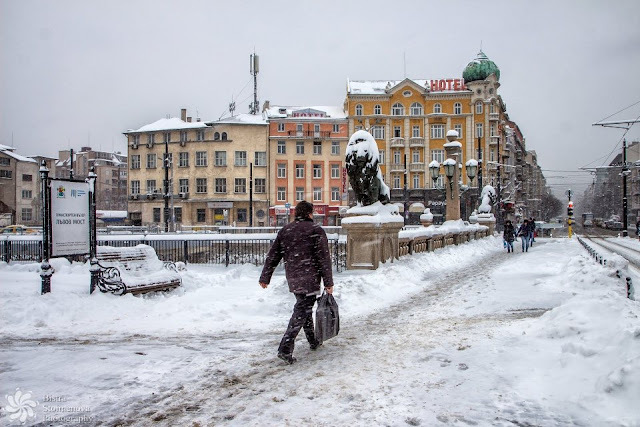 I understand that it's not an easy task if you carry a two-kilo black camera BUT in Eastern Europe people hate being photographed without permission. You can get into a big trouble if they notice you and you keep taking pictures without their consent, you can end up in the police station. The picture above shows a woman staring at the flag in front of the monument of the unknown (nameless) warrior (the brick building is an ancient basilica). I caught this woman by pure accident, don't even know if she was specifically looking at the flag but the image looks really dramatic. So if I had asked her to pose for me, she may have send me to hell (as some people would) or posed those artificial 'duck-face' poses I totally hate. So instead, I took a picture that doesn't show her face (which means that I can use it without her written consent, at least for non-commercial purposes). When people don't notice you are there, you can capture a lot more candid moments than if you go around and try them to pose for you. There are photographers that can approach anyone and get the perfect posed shot - well, I'm not exactly one of them. I prefer to play the paparazzi game. It may seem something obvious but believe me, when you start shooting, you easily forget that there other people (or cars) around you. 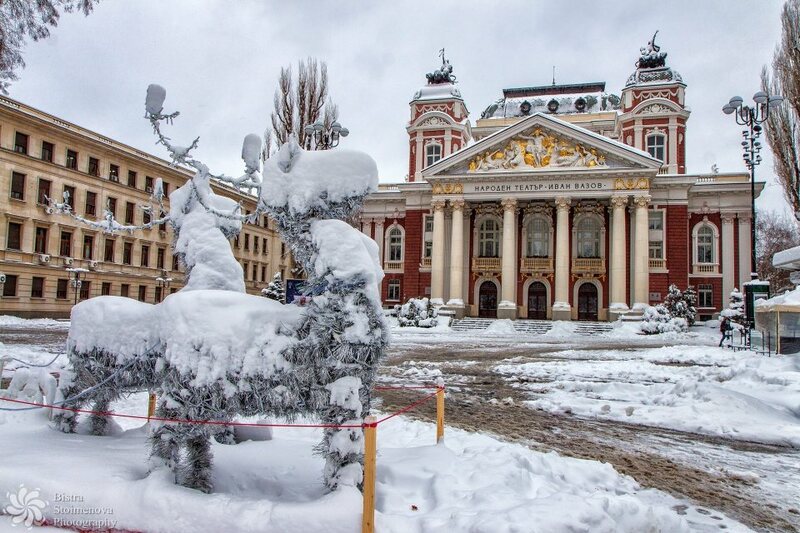 This building used to be the palace of the Tsar but in 1944 it was taken over by the Communists. It was built by an Austrian architect and used to have an ornate fence and gate - just like those of Belvedere palace in Vienna. The fence used to be cutting in two the street you see in the foreground but it was demolished in 1945. They had plans to destroy the building too but firstly they ran out of money and secondly some brainy people thought that it won't be a good idea. Now the building is an art gallery but nothing shows from the royal period - the place was completely robbed - the only evidence are the stone fireplaces (which are still there because they couldn't remove them). 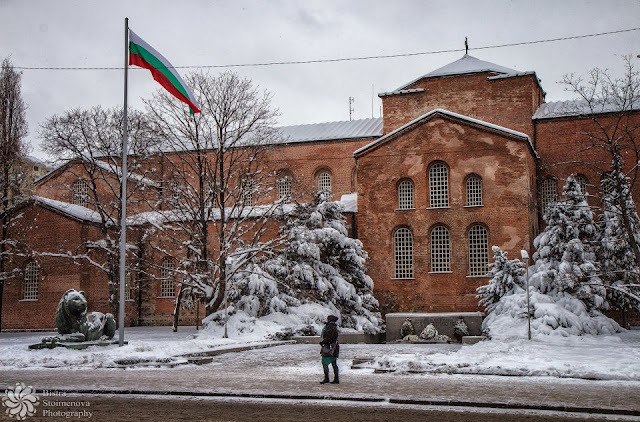 It has a really interesting story and is one of the most photogenic places in Sofia. Only problem is that it;s located on one of the busiest boulevards in the city. So when it comes to traffic - or anything else while you're out shooting YOUR SAFETY IS ALWAYS FIRST! No image is worth getting yourself in danger! First ensure that all other vehicles can SEE where you are and LOOK AROUND BEFORE you try to make a hasty move. For this shot I stood on the outside line of the boulevard and had to wait for the right moment when cars were on red light :) If you have to stand somewhere on the road - STICK TO THE SIDES OR STAY IN THE MIDDLE. DON'T MOVE BACK AND FORTH, YOU CAN GET HIT! Street photography is often about telling a story so take some time to learn a bit about it. Each city has enthusiasts that write about its history, you'll just have to check things out. The place is called the triangle of power in Sofia - the building of the Presidency (to the left) and the Council of Ministers (center and left). This place has a long standing controversial history. 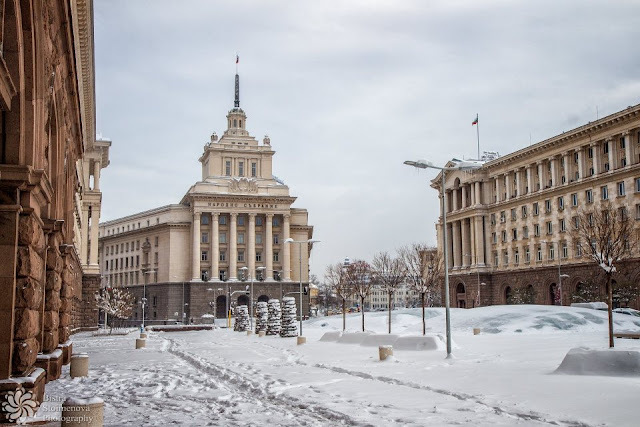 When Communism came in 1944, the new authorities were dead set on establishing a new order. So they demolished a whole district - the so-called Targovska street (where all trade and artistry in old Sofia happened) and the other lanes around it. 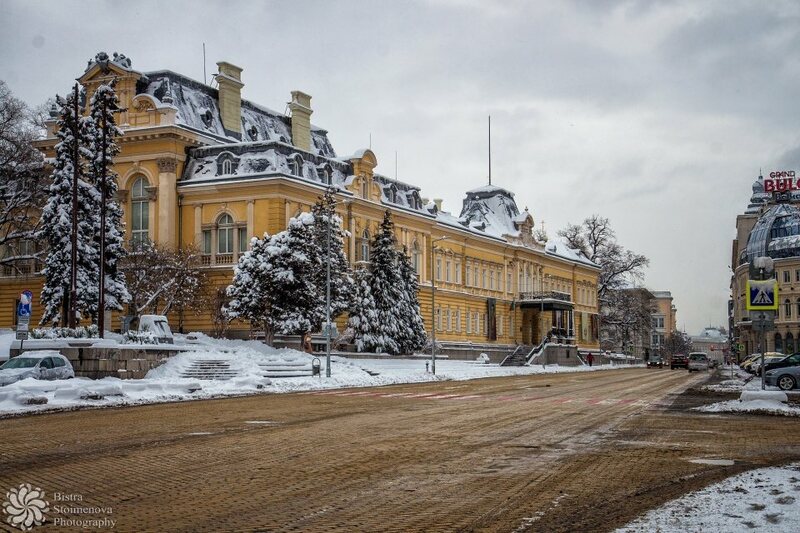 In the 1950s, when they started digging the foundations for these buildings, they reached the Roman stratum of Serdica - namely the palace of Konstantine the Great. And they poured concrete on it. Because no one can be greater than the Soviet Union. Now these stand as a reminder of a totalitarian regime and of stupidity. If you don't know what was destroyed to get these created, you might even marvel at them. So if you want to show the idiocy of the people who created the ensemble you'll need to know the story behind the place. Street photography is often about the architecture around is. We just can't escape that - we are surrounded by it so why not trying to capture it the best way possible. 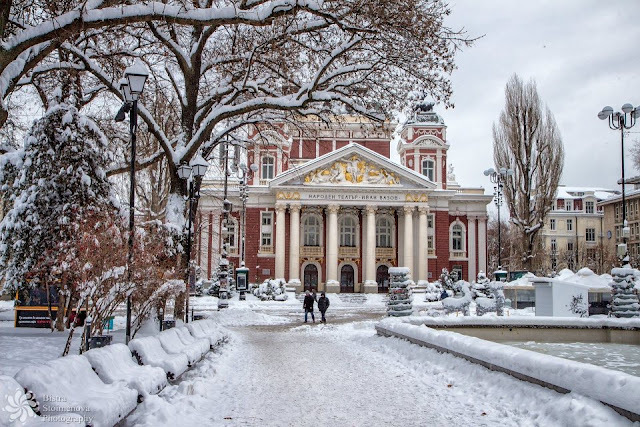 The building you see is the National Theatre Ivan Vasov which dates back to the end of the 19th century and is one of the most beautiful buildings in Sofia. So don't try to shoot people only - keep your eyes open for the things around you. Rule 6 - dress according to the season!!! I should have said this in the beginning but I thought it's too obvious. Anyway, I must add this. ALWAYS DRESS ACCORDING TO SEASON - during this photo shoot I had to wade through knee-deep snow, endured a blizzard (but I was already out so I decided to keep moving) and my hands almost froze on the camera (because, I repeat, it was -15 degrees Celsius). So I was lucky i had sturdy boots and warm coat and gloves, and a hat. You never know what might happen so it's better to take an extra item (like spare gloves or an umbrella) instead of getting back home soaking wet or ice cube frozen :) Big cities have a few disadvantages - it takes a long time to travel in them and the weather may vary, so you can't know for sure what the weather would be at the other end. The picture above - of the guy with the red coat - is a great example for something other than warm clothes in winter. I saw him for a few moments right as he was walking towards me. It was freezing cold and to top it all - the wind was blowing snow in my face. So I was kinda reluctant to shoot but then when he came closer I decided that I just CANNOT MISS THAT SHOT. It turned out to be one of the best from the series. so I'm glad I took it. I was also lucky that it was so cold so I didn't get noticed. So keep your eyes open and shoot everything you can - better to come home with more images than you need than to miss a one-timer. If you are into street photography, you are probably familiar with all the general photography rules - like the Rule of Thirds and the like. BUT when we are out shooting and all we see is people, we tend to forget that the same basic rules can be applied here. As you can see above, the lead-in lines help create a sense of depth and scale. I think I said it all - so all I can say here is "Good luck" and happy snapping. Posted by Bistra Stoimenova at 17:35 ч.